Nottingham Charity Song Released Today! We are very proud that our Choir is singing on a brand new song being released today. The song, titled "If Every Child Could" is available today. It has been released by the Nottingham Music Service. 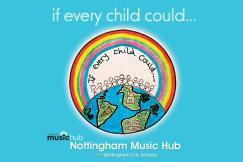 More than 800 children & young people come together to create Nottingham Music Service's first ever charity song! Help us raise funds for life-changing music projects for young people in Nottingham. Give everyone a chance to play, perform and progress!